Is there a better alternative to AccessMenuBarApps? Is AccessMenuBarApps really the best app in Desktop category? Will AccessMenuBarApps work good on macOS 10.13.4? AccessMenuBarApps is a simple app that gives the user instant access to all menubar apps by showing a reduced app menu (so that there is more space for menubar apps). Activating/Deactivating of the reduced app menu can be triggered by keyboard shortcut, mouse gesture, click on the menubar icon or click on the dock icon. AccessMenuBarApps runs as background app (can be configured to launch at startup) and is waiting for keyboard shortcuts (default SHIFT SPACE) or mouse gestures ("double knocking on the top border of the screen" and/or "pushing/squeezing the mouse on the top border of the screen" ) to activate or deactivate the reduced app menu and showing all menubar apps. Switching and mouse gestures (knocking and pushing/squeezing) can be visualized on the screen. So you can see the sensitive area of the top border of the screen. 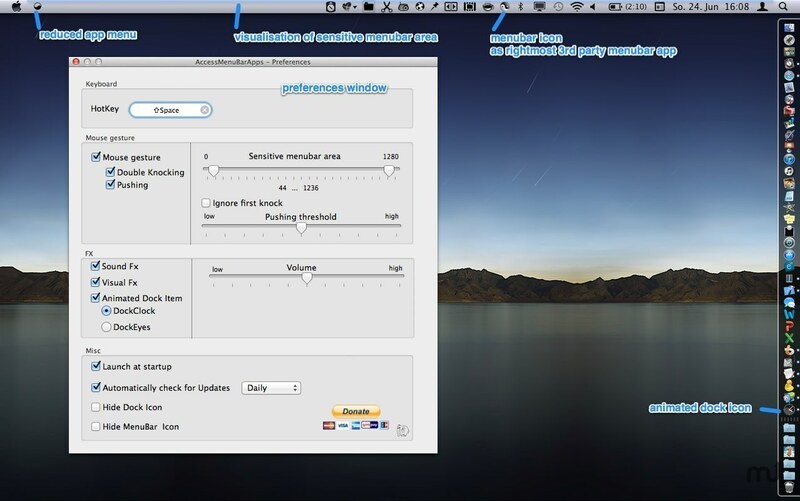 In the preferences window you can switch the visual effects on or off. You can hide the menubar and dock icon for a tidy menubar/dock. If the dock icon isn't hided you can change the dock icon to an analog clock showing the current time or to some eyes tracking the mouse cursor. You can configure the app in the Preferences window. AccessMenuBarApps is designed for users that have a small screen (like on a 13" MacBook (Pro|Air)) or lots of right side items.